Do art and TV belong in the same sentence? Do people lie about watching TV? Are commercials better than programs? 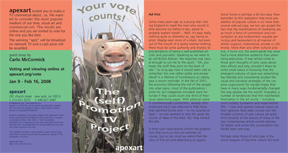 Can apexart get creative people to make a TV commercial about them? Help us spread the word to ad agencies, ad types, videographers, artists, and others. Submissions from all countries are encouraged. Join us on the last evening of the exhibition for a one-night-only performance of Already in Progress, a multimedia comedic play from no tea productions. Click here for details about the event and making a reservation. After the performance, we will announce the winning commercial from the exhibition. The exhibition was conceived to examine creative practices in contemporary culture and to reconsider the current promotional model of the art world. Some many years ago as a young man visiting England to meet the man who would in time become my father-in-law, asked to properly explain myself… Well, it’s easy really, nothing quite so shameful as, say, being an artist. Maybe even more of a sham, but even out of the mouth of a spotty twenty-nothing, there must be some authority and impress to proclamations of being a well-published art critic and journalist. Speaking as we were to an old British Adman, the response was casual enough to cut me to the quick: “Oh, you mean the stuff they print on the back of ads.” So long ago now it would seem odd to remember this one rather polite and proper rebuff in a lifetime of humiliations so clearly, save a recent reminder. In the fall of 2001, the economy following the will of the people into utter panic, most of the publications I write for (art magazines included) were fortunate if they could count one third of their usual advertising pages. With editorial space in commensurate constriction, already commissioned work was reduced to little more than glorified blurbs and -- to my surprise at least -- no one seemed to miss the great discourse of ideas in the least. No, they missed the ads. In time such hard lessons inform the pragmatism that turns us into our enemies of course, but so too must we admit that the view of fine art and advertising as oppositional forces is perhaps a bit too easy. Now beholden to this realization that most any address of popular culture is no more than reverse-side ad copy, we too can accept the fact that the machinations of marketing are as much a force of commission and consumption as any endowment- equally pernicious and benevolent to all manner of artistic support, institutional, private or otherwise. More than any other cultural practice, it turns out, the avant-garde has never had a more attentive audience than advertising executives. If ever artists come to those grim thoughts of who cares about their efforts and why, shouldn’t there be some small solace in knowing that the emergent industry of post-war advertising has liberally and consistently studied the visual and narrative strategies of the creative cognoscenti for myriad tropes that have in many ways fundamentally changed the way people see the world? Arguably, a number of tendencies that first manifested themselves in the art world -- including most notably Surrealism and experimental film -- have only gained cultural import as their gestures have been coined into the broader currency of pop culture ad spiels. And certainly as the oeuvre of many of the top contemporary artists would indicate, for better and worse this conversation has hardly been one-way. Perhaps what those of who play in the minor leagues of big time culture fail most to recognize is the actual role of advertising. You see, we tend to think that they are all out there to sell us something when in truth they are not in the least. Unlike gallerists, ad people are not shopkeepers. They have nothing to sell. Walking through a gallery district, or worse yet an art fair, one cannot help but be struck by how close to shoe salesmen most art dealers really are. Those who entertain and annoy us daily with their pitches, however, are not actually asking us for patronage -- they are rather our patrons. Imagine for an instant the kind of reception you would get if you walked into the corporate headquarters of say an Ogilvy & Mather, Saatchi, or Wieden+Kennedy to try to buy something, be it sneakers, a bar of soap, or a new car. Suffice it to say they have no desire to deal in goods. Thanks to gift shops and cafes, museums today in fact offer a lot more for us to buy than ad firms, which it seems are much happier buying stuff. Even in sold-out shows or the studio of the hottest artists there is usually something there for sale if you just have to have something, so it’s a little bit disingenuous for us to pretend some hierarchical authority over those more commercial forms of enterprise. If advertising is not there to sell us stuff, you have to wonder what it is they actually do. Well, this lack of understanding between the purveyor and audience is just one of many irksome details that advertising and the arts have in common. We each specialize in a service that is neither called for nor particularly appreciated. Both visual artists and ad men offer a product that is intangibly more than anything material, and together they are in equal pursuit of sensations, emotions and aesthetics that lie at some interstice where the object finds its appreciation. For all we may strive to mine the profound, ultimately our task is not so dissimilar to theirsimparting meaning onto the meaninglessness of things. Let us honestly ask ourselves, why do we hate them so? Perhaps it is because, albeit in ways that might debase content rather than elevate it, we not only do the same things, but also in measure of effect they are probably better at it. What this ‘it’ is can migrate with the necessities of market, culture, season or era, but in advertising we must understand that the product is incidental to its position in our imagination. Just like us, they are primarily concerned with the subtleties and incidentals of perception. We similarly hold the notion of objective truth to a scrutiny of ruthless subjectivities, and I imagine this practice is what makes us such inveterate liars all. When advertising is good, as it can be, and works well, as it often does, it doesn’t necessarily make us run out and buy the product in question. Simply, it imparts desire through the simulation of meaning. Artists today may be enjoying a far more diverse palette of intentions than the ad topography of need, greed and wanting, but I’d guess in terms of the psychological spectrum, advertising hits more sites in the collective psyche than we could possibly innumerate. Thanks especially to politics; advertising is able now to really sink its teeth into less product- friendly domains of hatred, fear and distrust. Much like art as well, advertising is a mimetic tool that both locates memory and manifests it. We all want to be remembered, this is inherent to creativity, but more than that we need to remember as our identity is purely a construct of our memories. For this, for the jingle that runs unchecked in your head, that logo that pokes your retina, and that slogan that sticks in your craw, thanks indeed for the memories. This exhibition has been made possible, in part, by the Lower Manhattan Cultural Council with the generous support of The September 11th Fund.